Click here to download the Alice in Wonderland audiobook for free! Buy 2, get a $1 Cat; Buy 3, get a $1.50 Cat; Buy 4, get a $3 Cat. Total = $1.42 each wyb 2+ $1.00 Catalina = $0.92 each! Get $3.00 Catalina = $0.67 each! Buy 3, get a $1.50 Cat. ; Buy 4, get a $2.50 Cat. ; Buy 5, get a $4 Cat. Get $4.00 Catalina = like paying $3.95/5 or $0.79 each! Payless is offering a $5 off of $25 purchase coupon on their Facebook page. Go here to print yours! The offer expires on March 15th! Hungry Hungry Hippos - $0.99! If you spend $20 on the following Georgia Pacific products you will get $5 back. 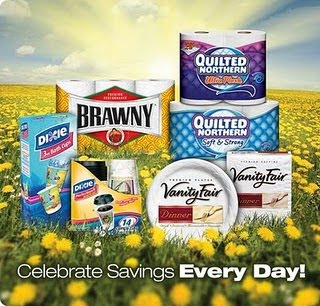 Participating products include: Brawny, Quilted Northern, Dixie, Sparkle or Vanity Fair product. Rebate offer is valid from 3/11 – 4/18. Click here for your rebate form. Final Price, as low as FREE with $5 RR! Final Price, $.75- $1 overage! March Extra Deals & Month Long Register Reward Deals: (I will make additions as we find them). 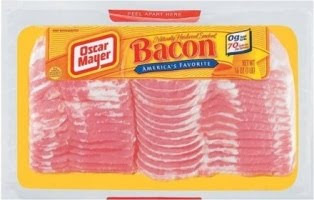 Click HERE to print off a $1.50/1 Oscar Mayer Bacon coupon. To get All You delivered to your mailbox click here!